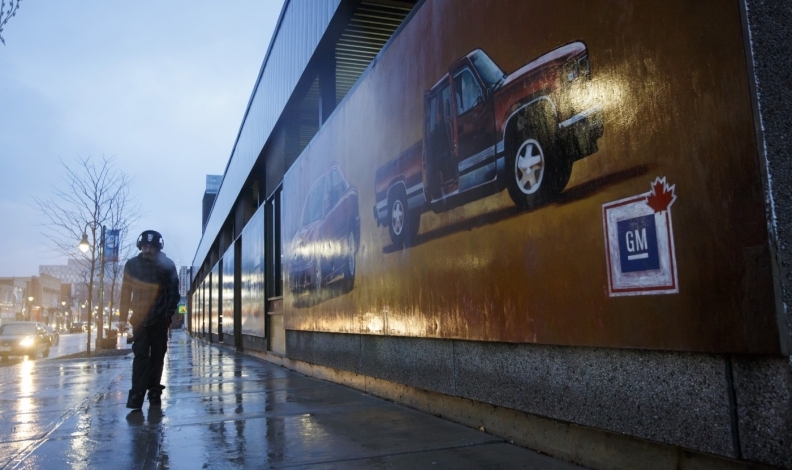 A pedestrian walks past a General Motors mural depicting in downtown Oshawa, Ontario on Nov. 26, 2018. The city is expected to see job losses in the thousands with the closure of GM's Oshawa Assembly Plant. Turmoil in Canada’s two largest export sectors — automotive and oil — threatens to undermine the country’s so-far-so-good economic expansion. General Motors Co.’s announcement Monday that it plans to pull production from its plant in Oshawa, east of Toronto, raises concern about the auto industry’s viability in Canada. It came on the heels of an emerging crisis in the oil sector, which is struggling with plunging prices and transportation bottlenecks. Combined, the automotive and energy industries generate almost one quarter of Canadian export receipts. So their troubles are a reminder there are no guarantees the economy will be able to pull off a smooth transition to a business-led expansion as consumers begin to tap out. Third-quarter gross domestic product data is due out Friday. “The news that we’ve been seeing both in terms of the energy and the auto sectors gives a little bit more caution to the degree of that pickup in exports and investment on a go-forward basis,” Craig Wright, chief economist at Royal Bank of Canada, said in an interview. Until now, things have been going well for Canada’s economy. It grew by a Group-of-Seven-best 3.1 per cent in 2017, and is continuing to expand at a healthy clip of 2 per cent this year even in the face of higher interest rates. A recent recovery in business investment, an improving trade picture and still growing consumer spending are helping to fuel the growth. But to keep growth at or near these levels going forward will require businesses to continue stepping up in terms of investment and exports. Most economists believe Canada’s highly-indebted households are about to slip into a long-term slump as borrowing costs rise, with consumer spending projected to slow down to some of the weakest levels on record outside of recession. Yet the recent developments in the auto and oil sectors raise the prospect that transition may need to take place without two critical industries -- a major handicap. While the shutdown of GM’s Oshawa plant will only affect about 3,000 hourly and salaried workers -- economists at Bank of Montreal estimate GDP could be hit by as much as 0.2 per cent over a full year -- the concern is it could snowball to other companies and spill over into the auto parts sector. The oil industry’s problems could be even more significant. Economists at Toronto-Dominion Bank estimate a hit of 0.5 per centage points to growth if the current pricing environment persists, though they do expect a rebound. Gluskin Sheff’s chief economist and strategist David Rosenberg estimates a larger-than-consensus growth hit of 0.4 per cent from the General Motors shutdown, with a similar 0.5 per cent hit from oil. That would take Canadian growth down closer to 1 per cent, far from the current pace, he said in a Nov. 27 research note that included ten reasons “to hate” the Canadian dollar. “As for Canada, the tale of woes continues,” he said.